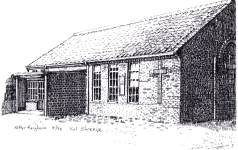 A fairly modern chapel built about 45 years ago on a green field site with plenty of parking space, in Green Lane, Potter Heigham through the old part of the village away from the Staithe and boatyard [about 1 mile walk]. To find us, follow the road from the Staithe past Lathams and turn right at the Post Office. Go forward, taking care as you cross the A149. Continue forward to the T junction. Turn left on School Lane, passing the Village Hall and old school on your right. Follow the road round to the right and the chapel stands in its own grounds. Our noticeboard announces all our special events. Alternate Mondays 7.30 – 9 p.m: Our Martham Singers, a group of enthusiastic singers, meet for practice. New singers always welcome. Operatic skills not essential! !